We are warmly greeted by the hotel concierge, elegantly dressed in a colorful sari. She briefly describes the history of the hotel. Surrounded by crystal chandeliers with imported glass from Milan, priceless antiques including a Louis XVI desk, and winding staircases, guests are transported back to a time reminiscent of the French Palace of Versailles. 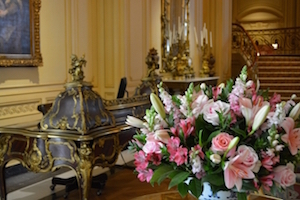 Fresh, fragrant floral arrangements scattered throughout the lobby are a perfect complement to the elegant ivory and gold interior. It is 3 o’clock and time for tea. 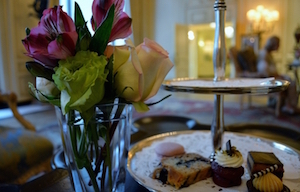 Steeped in tradition, The Westgate Hotel has served afternoon tea for 40 years. Regarded as a quintessential British pastime, tea arrived in 17th century France 22 years before England had its first delectable taste. The setting could not be more appropriate. Tea service is provided on antique tables covered with white linen, finely appointed with bone china. While relaxing to a melodious harp, guests sip champagne as they preview the enticing menu. Dressed in formal black and white attire, attentive waiters assist guests in choosing from a variety of fine teas including Darjeeling and Jasmine, guaranteed to soothe the soul. The English Breakfast tea was an excellent choice, full-bodied, smooth, with delicate floral undertones. 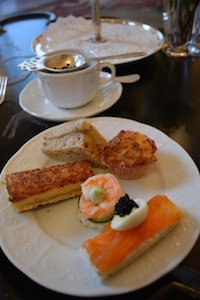 Five unique tea sandwiches designed to tantalize the palate are elegantly presented on a silver tiered tray. And they did not disappoint. Seasonal selections included Black Tiger Shrimp with Cucumber and Dill Cream Cheese, Humboldt Fog Goat Cheese and Truffle Honey on Brioche, and House Smoked Salmon with Quail Egg and Domestic Caviar. A perfectly textured raisin scone with Devonshire cream and summer berries comprised the equally divine second course. “Now,” says the waiter, “we have saved the best for last, our savory petit fours.” Delectably decadent, these delights inspire guests to leave no crumb behind. Seatings for traditional tea service are offered Friday, Saturday, and Sunday from 2:30 until 5:00 p.m. Private teas can be arranged. Reservations are recommended.